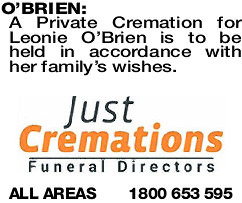 A Private Cremation for Leonie O'Brien is to be held in accordance with her family's wishes. O'BRIEN LEONIE Passed away peacefully on the 26th March 2019. 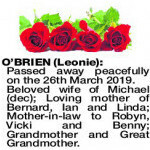 Beloved wife of Michael (dec); Loving mother of Bernard, Ian and Linda; Mother-in-law to Robyn, Vicki and Benny; Grandmother and Great Grandmother. 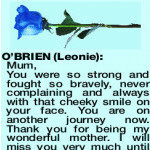 You were so strong and fought so bravely, never complaining and always with that cheeky smile on your face. You are on another journey now. 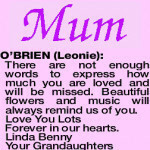 Thank you for being my wonderful mother. 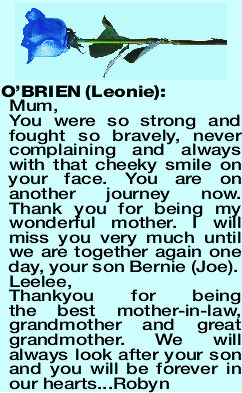 I will miss you very much until we are together again one day, your son Bernie (Joe). 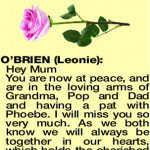 We will always love you and will miss you so very much. 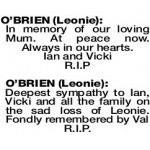 Our memories of you will keep you close in our hearts always. Take care on your journey. 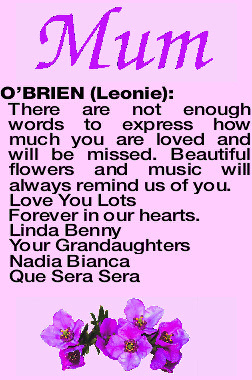 O'BRIEN LEONIE There are not enough words to express how much you are loved and will be missed. Beautiful flowers and music will always remind us of you. 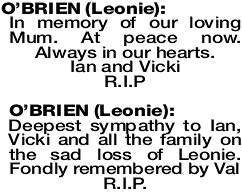 Condolences to Leonie's family. 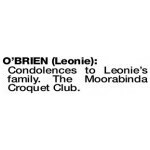 The Moorabinda Croquet Club.